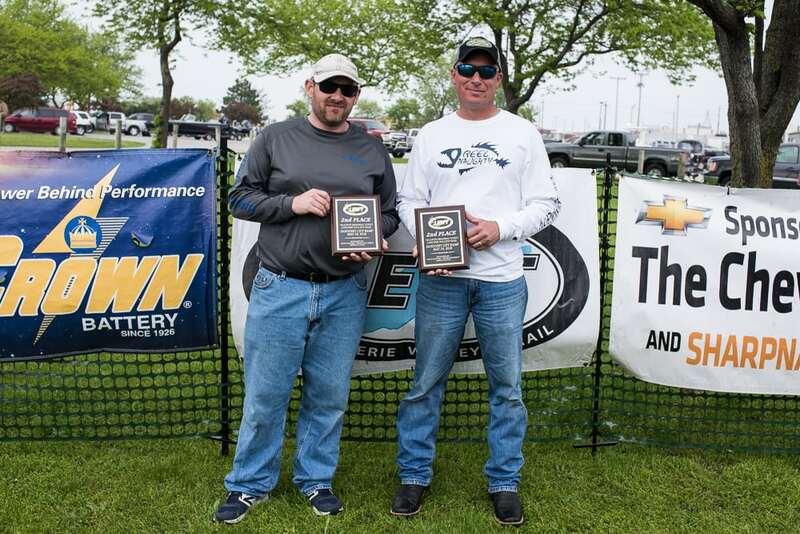 A one-day postponement due to winds couldn’t slow down the “Ole Pete Memorial” Crown Battery, Sharpnack Direct, Lake Erie Walleye Trail (LEWT) event at Sandusky May 20. 57 teams roared out of Sandusky bay under cloudy skies and light rain. 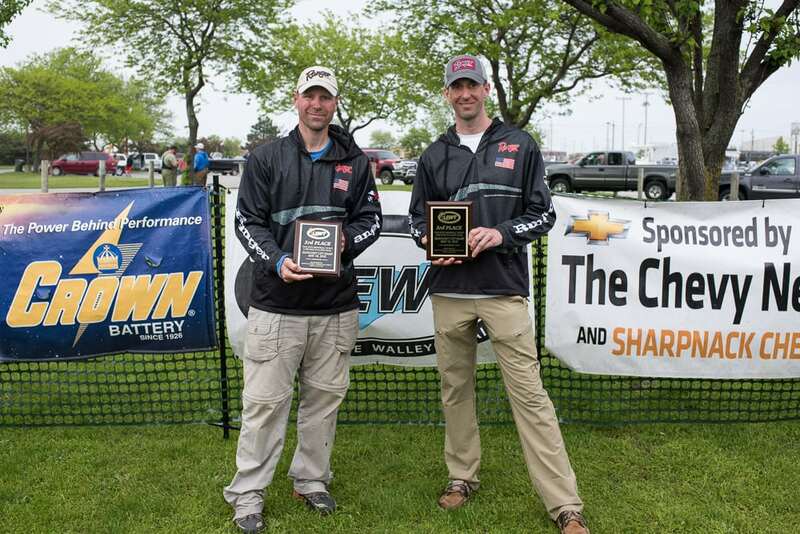 Figure them out they did, as the father and son team of Aaron and Wyatt Humbert of Republic, Ohio, shocked the field by staying inside Sandusky Bay and collecting a monster bag of five walleye weighing 39.14 pounds to take the win and $3,100. 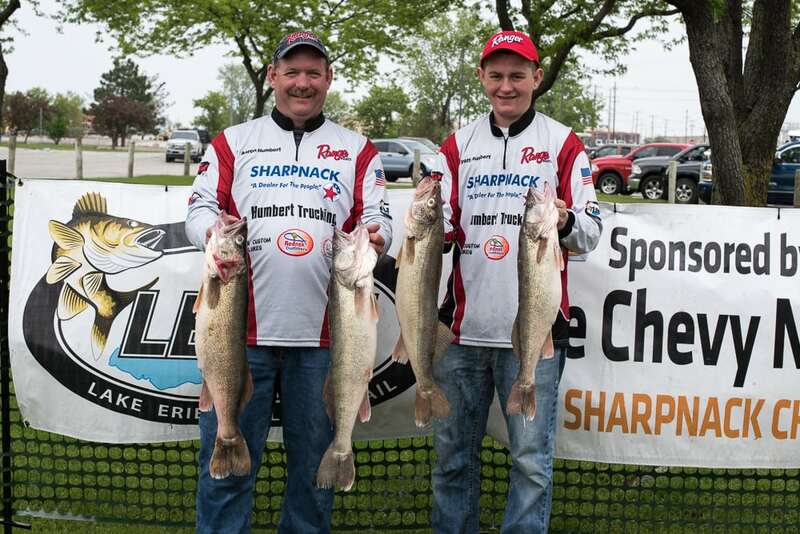 Second place and $1,725 went to Jerome Dorlack of Northville, MI, and Nick Meisner of Swanton OH, with five walleye weighing in at 32.64 pounds. Third place and $1,300 went to Michael Doornink of Wexford PA, and David Pontius of Blacklick OH, with five fish at 32.53 pounds. The first place Big Fish plaques and $562 also went to tournament winners Humbert and Humbert for landing the largest fish of the tournament at 10.18 pounds. The second largest walleye of the day weighing in at 8.96 pounds, worth $368, was landed by Shawn Hornbeck of Fredericksburg OH, and Tyler Bethold of Columbia Station OH. 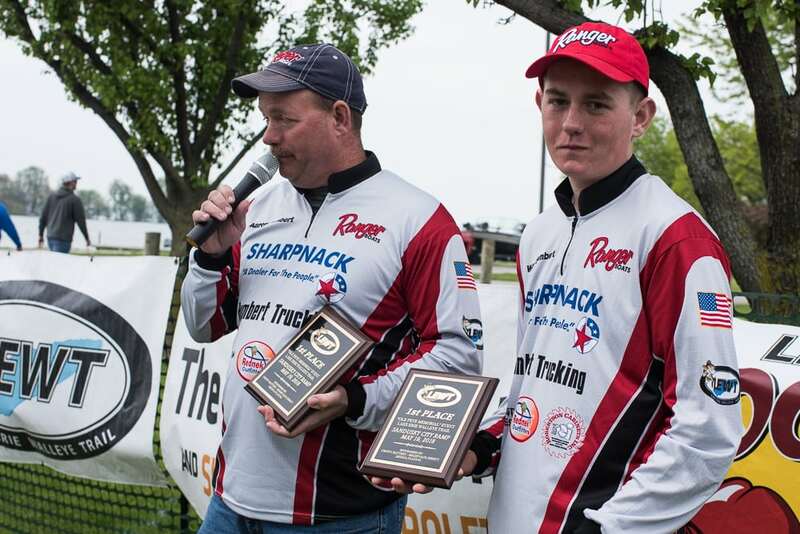 Long time LEWT supporter Sharpnack Direct in Willard Ohio offers a cash prize to the highest finishing LEWT angler at each event who owns a used or new vehicle purchased from Sharpnack. The Humberts also won this $150 cash award. Ranger Boats pays $500 to qualified Ranger boat owners under their Ranger Cup program. The Humberts continued their clean sweep of the top awards by collecting the $500 award! Medina Plating sponsors our Early Bird contingency that goes to the top finishing team that entered all four events before the Early Bird deadline. Of course, Aaron and Wyatt added this $150 prize for a total take on the day of $4,462! The final four are set in the $6,400 LEWT Knockout challenge. The NCAA style knockout format pits two teams against each other at each tournament, with the final four fighting it out at the two-day championship finale held in Huron June 8 & 9. Day one will have Aaron & Wyatt Humbert matched against Roger Hill and Dave Frey. The other side of the bracket features Bob Barnhart and Eric VanDenk facing off against Shawn Ritchie and Mark Brumbaugh. Day one winners will fight it out on day two to see who takes home the $3,000 first place prize. Second receives $2,000, third $1,000 and fourth place is worth $400. The “Ole Pete Memorial” is held in remembrance of our friend, and former club member Don Peterson. Don was an avid competitor and supporter of our club and circuit, and he is dearly missed by all. Many of the LEWT anglers donated their walleye catch, which will be cleaned by Lake Fish in Sandusky. These filets are donated to the Victory Temple Soup Kitchen in Sandusky who uses this resource to feed people in our community who need assistance. The Western Basin Sportfishing Association (WBSA) is a social based club for anglers that fish in the Western and Central Basins of Lake Erie and its tributaries. 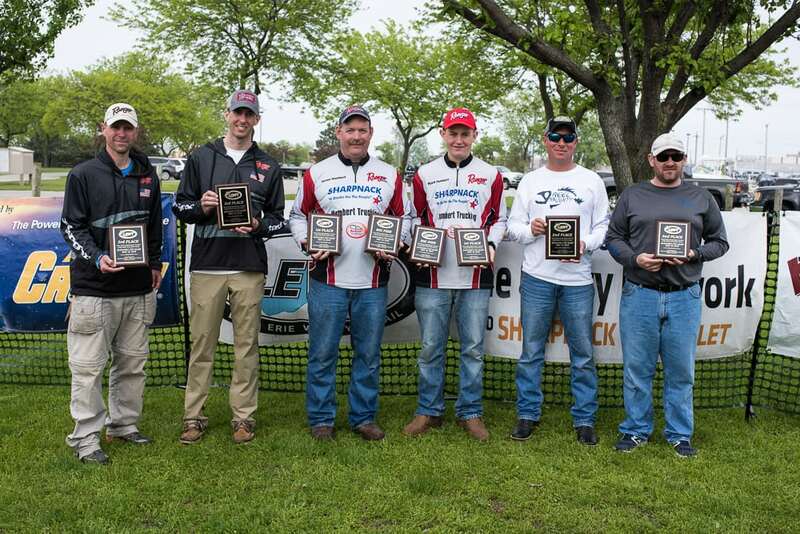 The WBSA operates the popular LEWT tournament series on Lake Erie. Membership is open to anyone interested in fishing, no matter their location or skill level. Our goal is to present information in a manner that will help sustain and improve fishing in one of the greatest inland sport fisheries in the world. Scientific information, fishing techniques, locations and presentations are presented at our meetings by expert and knowledgeable speakers and tournament anglers from our group. These anglers are very open with techniques, and will help any member that is trying to learn new methods. Please support our 2018 LEWT sponsors, without whom we could not operate the circuit. Crown Battery Systems, Sharpnack Direct in Willard, Medina Plating, Magee East Campground and Marina, Ranger Boats, Waldo Peppers Restaurant, Smooth Moves, Worldwide Marine Underwriters, Reef Runner Lures, Vic’s Sports Center, Erie Outfitters, Rednek Outfitters, Hi-Way Bait Tackle and Lodging, and Domka Outdoors.